Our live topiary birdcages will keep your pet's living arrangement elegant. High quality and very tastefully designed, your pet will love it! Do you have a friend or loved one who loves plants? Have you been searching for the perfect greenery to decorate your home or office? Do you need the perfect plant for a wedding or bridal shower? If you’ve answered “yes” to any of these questions, then Birdcage live topiary plants may put an end to your search. The Birdcage ivy live topiary is a hearty yet still elegant and delicate ivy plant. It is both feminine and beautiful, which makes it the perfect decoration for a home or event. The whimsical design of the ivy branches into a gorgeous, impressive birdcage makes it a show-stopper and conversation piece for many types of events. Read on in our Birdcage topiary how to to learn how to care for yourLive Ivy Topiary and to get inspiration for using it throughout the year in your home and at your events. The Birdcage live topiary is a lace-like ivy plant that can withstand wide range of temperatures. In fact, you literally cannot harm this plant unless you overwater it. The ivy topiary adjusts its growth in wide-ranging temperatures from 40 degrees Farenheit all the way to 80 degrees Farenheit. It thrives in an environment when it can get indirect sunlight. Check out your birdcage ivy topiary every day to make sure it has enough water. You want the soil to be slightly moist every day, but you should make sure it approaches dryness before watering again. Do not let the roots of this topiary stand in water. Do not let water congregate in the topiary pot. You will kill the topiary ivy with too much water, so we cannot over emphasize proper watering. Finally, make sure you are taking care to prune your ivy topiary. The birdcage frame provides a solid structure for the ivy to grow and the leaves to bloom. It also will help you notice when the plant begins growing outside of the frame. So check on it every day and prune your Birdcage topiary incrementally. There are many spots for your Birdcage ivy topiary – whether in your home, office or outdoors. The key is to keep the topiary away from hot, direct sunlight. 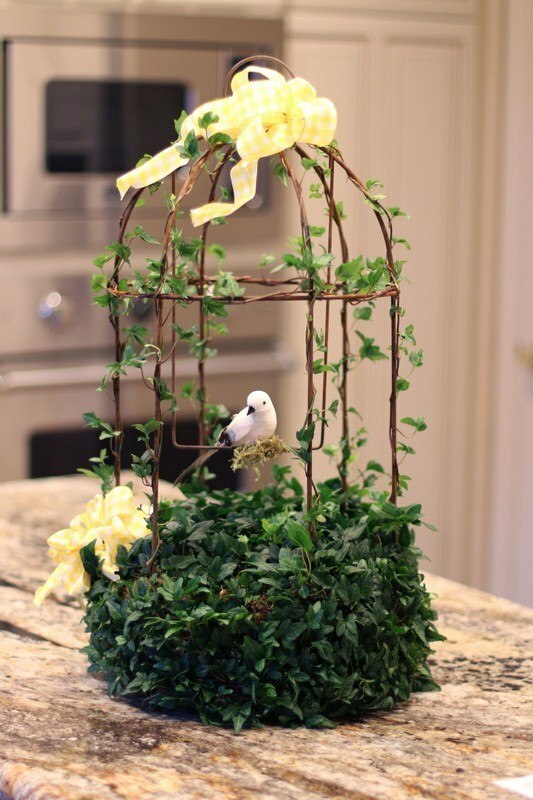 The unique design of the Birdcage topiary makes it an elegant home decoration item. For example, place it on a mantle, as a table display or on a piano for dramatic flair. Are you having an outdoor garden party, bridal shower or wedding? The Birdcage topiary is the perfect décor item for the gift table or refreshment table. These economical plants also could easily be used as table displays at a spring or summer wedding.